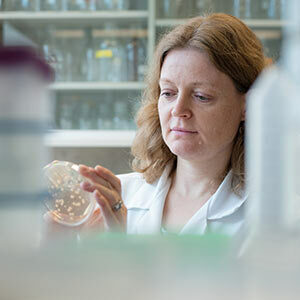 My research focuses on the study of yeast populations associated with the vineyards of British Columbia’s Okanagan Valley. We partner with the BC Wine Grape Council and associated wineries to perform spontaneous fermentations and isolation of the wine yeast Saccharomyces cerevisiae (S. cerevisiae). Using high-throughput genotypic analyses, we generate a genetic fingerprint of each S. cerevisiae strain and compare it to a fingerprint database of S. cerevisiae commercial wine yeast strains that we have generated. Our goal is to identify S. cerevisiae indigenous to the Okanagan Valley with enological potential. We collaborate with Dr. Dan Durall’s laboratory at UBC-Okanagan to achieve this goal. My lab uses S. cerevisiae as a model system to study retrotransposition. Retrotransposons are repetitive DNA elements in the genome that can replicate and insert a new copy into the genome via an RNA intermediate. We study the Ty1 retrotransposon which has a structure and life cycle similar to human immunodeficiency virus type 1 (HIV-1) except that Ty1 does not exit the cell. Our focus is to identify host factors that interact with integrase, a conserved protein that is required for insertion of retroviral/retrotransposon DNA into the genome.